Trying to lose weight can be hard. If you love to eat out, it can be even harder. If you love Panera bread; this is an article you will want to read. I will review the best items to eat at Panera on a diet. Many people have been asking me how to eat healthy at Panera bread, I eat there once a week and I always get something tasty and diet friendly. However, It can be very easy to get distracted and go for some of the calorie dense items. Panera specialize in bread and sandwiches, so there is a tactic to eating healthy there, while getting the most delicious meal at the same time. I am going to break down each section of the menu, so that you can best utilize my strategy on how to eat healthy at Panera. I will start with drinks since that will be the first thing you will want to choose on your visit. Firstly, I will cover the major no nos; any soda (sorry, you will have to stay away from the Jones Soda for this to work), Iced Chia Tea Latte, any smoothie or frozen coffee (one frozen caramel has more calories than a low calorie sandwich), all lattes. While it may seem like I just deemed every beverage unfit for this diet, there are still plenty of options available to you. The Iced coffee is only 20 calories, as Is a regular coffee (just watch the milk for calories). Sparkling water is becoming more popular and with a wedge of lime can be the utmost refreshing especially on a hot day. They also offer flavored sparkling water with 0 calories, personally I like the unflavored San Pellegrino. The pick 2 can be an effective option because you can still enjoy a smaller sandwich and supplement it with a low calorie soup or a salad. On the other hand, you could match 2 sandwiches together but you need to read the calorie info because you could easily find yourself with a 1000 calorie lunch just form the sandwich. Half a veggie med and any salad is a very healthy option and has around 400 calories total. 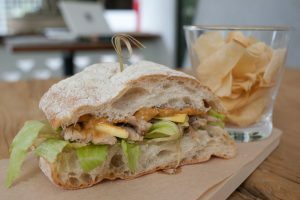 The Italian sandwich and the steak sandwich will also add a lot of calories really quickly, and the portions are not big. You cannot go wrong with a salad, especially at Panera. The sounds are delicious, and they are all very different. Napa chicken, Vera Cruz and more. 500 calories and it’s all healthy, the only thing that could get you is the dressing that comes with the Chicken Vera Cruz salad. A nice feature that Panera offers is a calorie count on each item as you browse on their website. So if you are unsure what you want just keep your calorie count low. It is all about the calories in this game. White breads, sour dough and breads with breads with fruit will all be higher in calorie count so just be careful and get yourself a whole wheat bread.